My overall filter size is : Under 400 square inchesBetween 400-800 square inches(+$5.00) Over950squareinches(+$10.00)"
Low Initial Resistance - 0.12 inch W.G. 5/8" thick filters fit most 1" applications. The ELECTRA-FLEX is made to bend and flex to go where metal-framed filters can't go. The filtration specs on the Electra-Flex is the same as the Electra-Silver and Electra-Gold. These same air filters are usually only available through HVAC contractors. They generally charge their customers $75-$150 for these same filters. Our buying power and low overhead allow us to offer these filters for 1/2 price. Replaces throw-away disposable furnace (also called a/c) filters. These filters will clean your indoor air of allergens like pollen, dust, mold spores and pet dander. Our filters come with Lifetime warranty. Your satisfaction is 100% guaranteed! THESE ELECTRO STATIC AIR FILTERS REMOVE UP TO 95% OF AIRBORNE CONTAMINANTS. Flexible frames are used for applications where a rigid frame will not fit. The edges of the filter are woven and the filters will bend and twist. THESE FILTERS ARE BUILT TO LAST - just hose it off, air dry, and reinstall. 1. Flex filters are 5/8 inch thick. 2. Filters are shipped from Las Vegas, Nevada via Fed-Ex Ground. The factory normally has a turn around time of 5-10 business days from payment to shipment. 3. 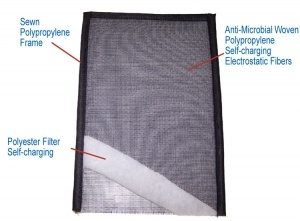 All 3 Air-Care filter styles (Silver, Gold & Flexible) have the same electrostatic media and the same specifications. 4. Gold and Flexible frames are $10.00 more than standard metal frames.